Plastic CNC (Computer Numerical Control) consists of machining a plastic block in the mass. This method of digital milling by material removal, called “subtractive”, allows more rigorously identical copies of the same quality to be obtained for all copies of the same lot. Very close series parts, they can be used for visual and functional tests. 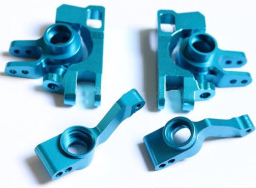 Wide range of resins in the “right material”: plastic CNC machining allows parts to be obtained with mechanical properties close to the injected part, depending on the desired functionalities and the desired final appearance. Thus, it is possible for example to obtain transparent parts and even to machine certain metals such as aluminium and brass. Wide range of finishes: after machining, polishing is possible to remove rough edges. It is also possible to paint the prototypes in the colour of your choice. You can find our finishes here. A high-performance method: this “subtractive” technique allows very high performance in terms of quality for even the most complex geometries. Ideal for parts with larger sizes: the use of the “subtractive” method makes the creation of prototypes larger than 600 mm easier and more efficient than stereolithography and vacuum casting. Economical and fast: due to the lack of a mould, costs and times are reduced. This is the most efficient and fastest method of rapid prototyping for quantities of fewer than 10 parts, allowing greater responsiveness to your needs. Few economies of scale: the limitation of this technique is that it does not allow significant economies of scale in the absence of a mould. Production of small quantities: due to very limited economies of scale, this method is not recommended beyond 10 prototypes or plastic models.